A pair of sprightly llamas jigged their way to immediate social media stardom last Thursday (February 26) after they led dozens of US police a merry dance on the bemused streets of Phoenix, Arizona. The duo, one white and the other black, had the eyes of the world on them as American media transmitted live footage from the air of them darting across busy roads and parking lots in their brazen – and for an hour successful – attempt at evading capture. Their run for freedom, after numerous hapless attempts at capture by police and members of the public failed, finally ended when first the black one was lassoed and taken in, followed soon after by the companion, when it was cornered and gave up the game. Twitter lit up after their heroics, with #whitellama, #llamas, #teamllama and ##llamadrama all trending. 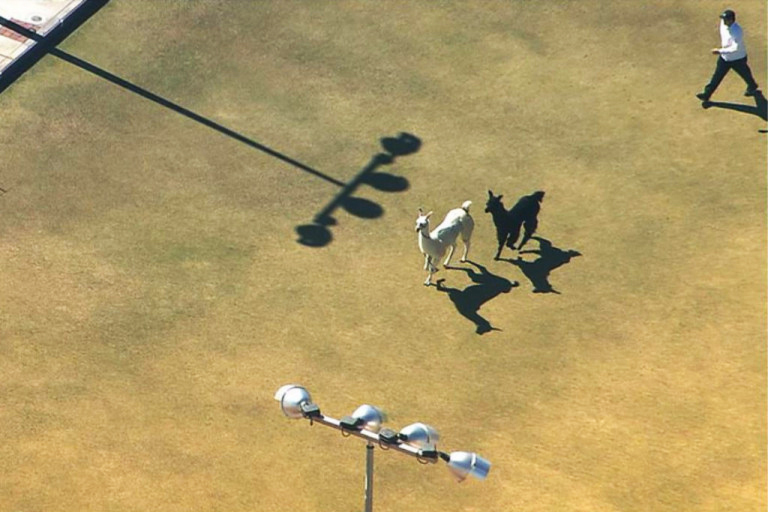 The llamas escaped after a rancher brought them to an assisted living facility to visit an ex-llama rancher as a form of animal therapy, Lieutenant Brandon Jones, of the Maricopa County Sheriff’s Office, told local media. Jones said the animals were spooked when the door of the trailer that was transporting them to the site opened. There were actually three llamas in the trailer, but only two ran for it.